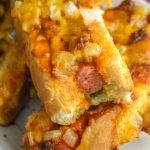 An easy way to take your hotdogs to the next level, this oven baked version makes loaded chili dogs with crispy outer edges. Line the inside of hot dog buns with mayonnaise and mustard. Evenly add the relish. Fill with hot dogs and squeeze the stuffed buns into a 9x13 baking pan. Top hot dogs with chili, diced onion, and cheese. Cover with aluminum foil and bake at 350 degrees for 45 minutes. Carefully remove from the pan with a spatula and serve.